NONILLION is a three person group show curated by Lauren Portada, currently on view at Regina Rex in Bushwick, Brooklyn until February 26th, 2012. The exhibition, as stated in the press release, focuses on light, materials and linear mark making. As for materials, several different mediums are present including sculpture, painted collage, electric induced installation and photography. Each piece has a minimalist aesthetic quality however upon closer inspection, an intricate attention to detail and precision is revealed. 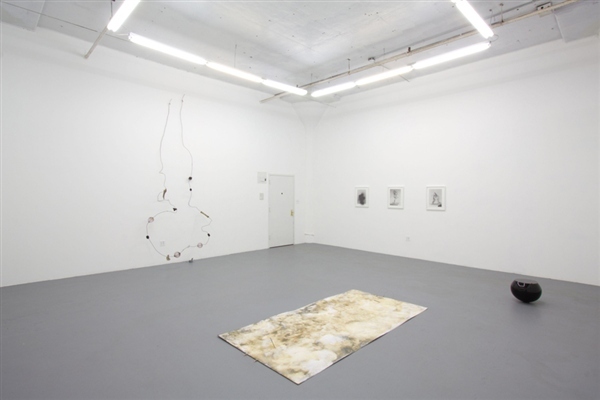 This effect results in the initial viewing of the gallery to appear sparsely curated, but within this choice of context, the space itself becomes a relevant container of sorts. Air is extremely important both for work to exist and also as an element that NONILLION represents. Water, fire, earth, metal, and wood are subtly interlaced as an energy force that is conceptually present. 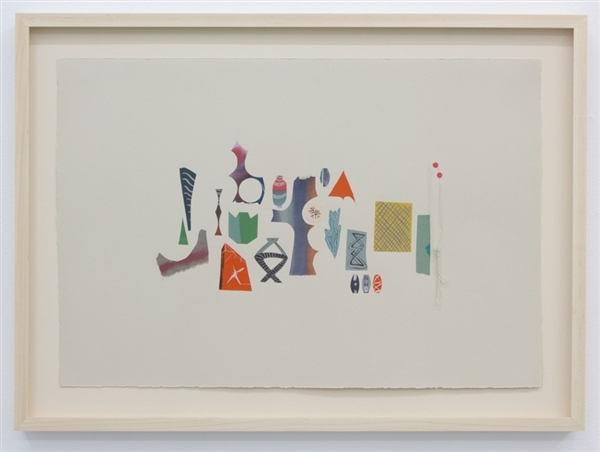 Artist Katy Fischer’s works on paper, Collection 1 & 2, both dated 2011, are just that, a collection of biomorphic forms that have been arranged on a paper surface. At initial glance, the shapes appear to loosely reference familiar objects but in fact are colorful abstractions that seem to exist or have been placed solely for the sake of composition and the study of proposed imaginary landscape. Her color palette is also uniform and simple however several painted cut-outs are multi-dimensional because of the tonalities of color that lends itself to three-dimensional form. The artists earlier work (as viewed on the Drawing Center Artist Registry website) are telling of her investigation into East Asian culture, nature and miniatures, but beyond the 2008 gouache on paper titled Water, Collection 1 & 2 leave much more to the imagination and hone in on the importance of absence and removal of pertinent visual information. Joe Brittain, a 2011 sculpture resident with NYFA, takes a more physical approach to his work and his choice of materials. 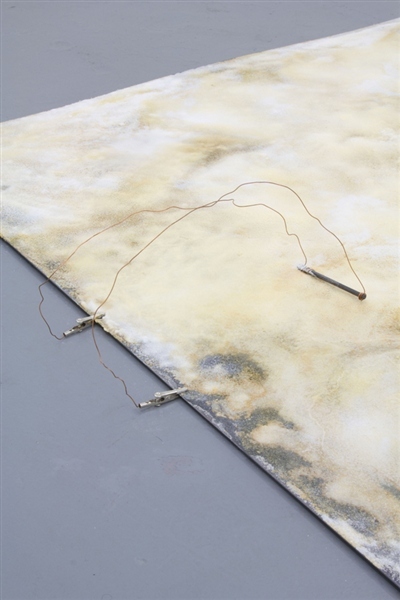 In No diminution in the sum of things, 2011 (shown above in detail and in the top photograph in installation view), the artist has utilized salt on a steel surface along with copper wire and graphite drawing in order to create a chemical reaction resulting in rust. The reaction is ongoing and allowing for a piece that due to an organic process has the propensity to visually alter with time. Brittain represents the elements of earth, metal and the power of magnetism. Copper wire was often used by the artists from the Arte Povera movement in the late 1960’s-1970’s due to its properties to conduct electricity. For NONILLION, curator Lauren Portada provides art as instruction or a map that has the option remain contained or continue expanding. Another piece by Joe Brittain is Ocean and Boat, 2011a glass sphere with the very top sectioned off, hollowed out and filled with ink. A cord is in the ink with a magnetized needle which gives the allusion (and maybe functions?) as a Gothic compass. The piece reminded me of a miniaturized version of Richard Wilson’s 20:50 which I first viewed during my trip to the original Saatchi Gallery in 2001. There is an aspect of illusion, mathematical precision and absurdity. The artist has made a visually appealing object that appears as if to have a function but may in fact just be an object for object’s sake. Brice Bischoff contributed several black and white photographs which appear to be documentation of an experiment gone awry. His work was the most flat of the trio but seemed to represent fire. Visiting his website, it appears as if he works in film, photography and installation. The photographs are documentation of a performative gesture that occurs in nature. 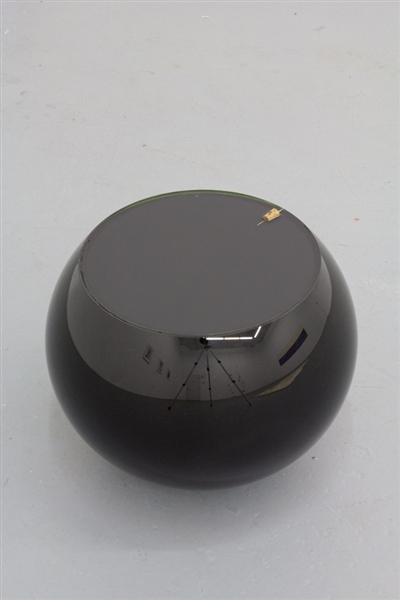 Remainder, dated 2010 is a black and white photograph of smokey matter, that floats from an unseen object (possibly glass).The effect is eerie and otherworldly, however a bit modest in scale. Overall, NONILLION is an interesting exhibition, stripped down and raw. Looking forward to more shows at Regina Rex, a fairly new entry to the burgeoning Bushwick art scene. Regina Rex is located at 1717 Troutman Street and will have their next opening on March 3rd, 2012.